On this page: State weather bureau PAGASA's news update on Bagyong Paeng, which intensified into a Typhoon, as of Sunday, November 2, 2014. 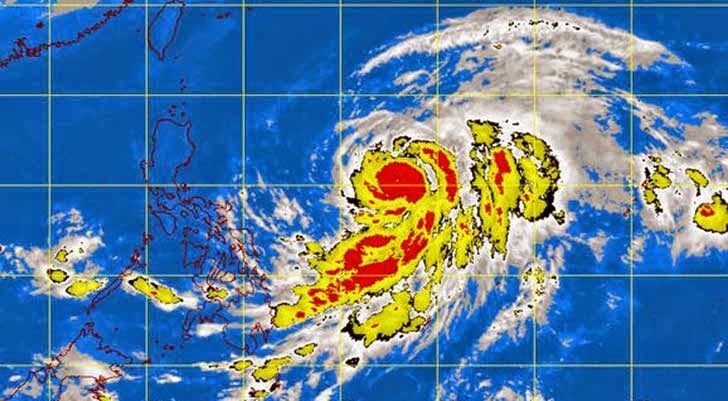 At 4 a.m. today, weather forecasters spotted Paeng at 1,220 kilometers East of Baler, Aurora, with maximum sustained winds of 120 kilometers per hour near the center and gustiness of up to 150 kph. It is forecast to move North Northwest at 13 kph. PAGASA says the Northeast Monsoon is affecting Northern Luzon. In effect, the Bicol region, Eastern Visayas, Northern Mindanao, CARAGA and the provinces of Palawan, Batangas and Quezon will have cloudy skies with light to moderate rainshowers and thunderstorms while Cagayan Valley, Cordillera and Ilocos region will exprience partly cloudy skies with isolated light rains. According to the weather agency, Metro Manila and the rest of the country will be partly cloudy to cloudy with isolated rainshowers or thunderstorms. Moderate to strong winds blowing from the northeast will prevail over Luzon and Eastern Visayas and the coastal waters along these areas will be moderate to rough. Elsewhere, winds will be light to moderate coming from the northwest to west with slight to moderate seas, PAGASA added.